Beautiful images and the essays that drive them. 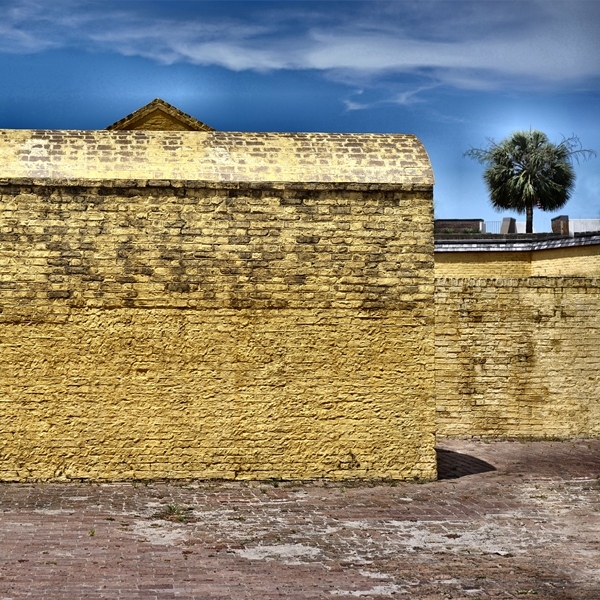 CHARLESTON, REFRAMED is a 14-piece exhibit of photography from Charleston, South Carolina. The photographs were taken June 21-27, 2015 using the Sony A7R full-frame camera with the Carl Zeiss 55 mm f/1.8 lens. When I posted my photo-essay CHARLESTON: 72 HOURS last year, I knew it wouldn’t be my last examination of that great Southern city. This year I took a more relaxed approach, and while the shift may not be obvious in the subject matter, what’s certainly evident is how I felt free to experiment with a wide-range of finishing effects during image editing. In fact, one of the major themes in the work below is the multiple digital effects used to finish nearly every study. The photographs equate to 1.5% of the pictures I took that week. Nearly a month after my visit, I relaxed on a coastal Maine deck and began the selection and editing process. Choosing my favorite pictures brought me back to the city whose people continue to impress with their grace and welcoming manner. I hope you enjoy what you see. 1. Through earthquakes and war. 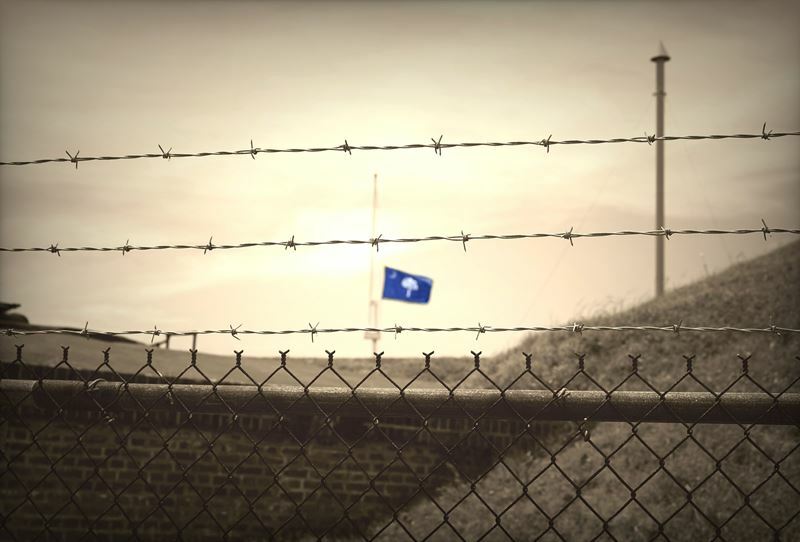 Charleston sits on an active fault and also, has suffered bombardments and occupations by the British and the Federalists. This building provides a feel for the city’s storied history. 2. My Charleston Tableau. I knew this interior-fortress scene had artistic potential while I impatiently waited for tourists to clear out of sight. They cleared, and I got my tableau–in 104-degree midday heat. Color, texture, palmetto tree, and a mishmash of brick and cement finishes all spoke to the Charleston impression. 3. 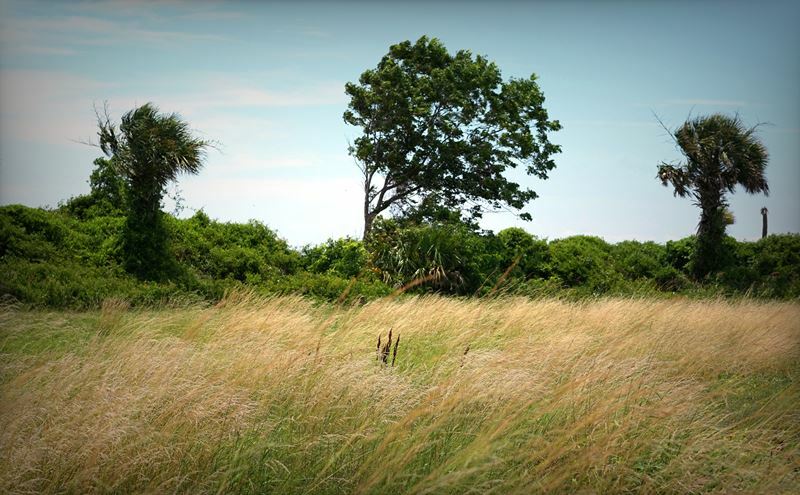 Windy field, Fort Moultrie National Park. On a modest point at a rocky edge of Sullivan’s Island sits a field. This field held my interest quite a bit, even as other tourists steered clear of the flowing grass you see here. It’s easy to imagine two centuries worth of soldiers training and drilling, perhaps on this very spot. Judging by the center tree, the strong offshore winds are a regular feature of the grounds. A beautiful, peaceful place. 4. Chevaux-de-frise at Miles Brewton House. 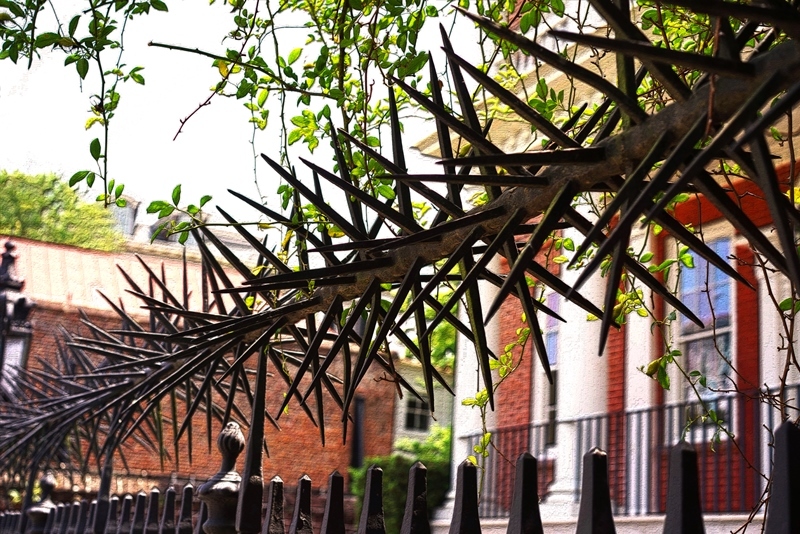 These iron spikes were constructed circa 1822, as a response to an anticipated slave revolt. This King Street National Historic Landmark property serves to remind us what men can and will do to other men. A question: If this item hadn’t been preserved, would a description of it make a comparative impression on you? 5. Spanish moss morning. This photograph was taken in, shall we say, an unglamorous neighborhood where I never for a moment felt out-of-place, threatened, or intruding. 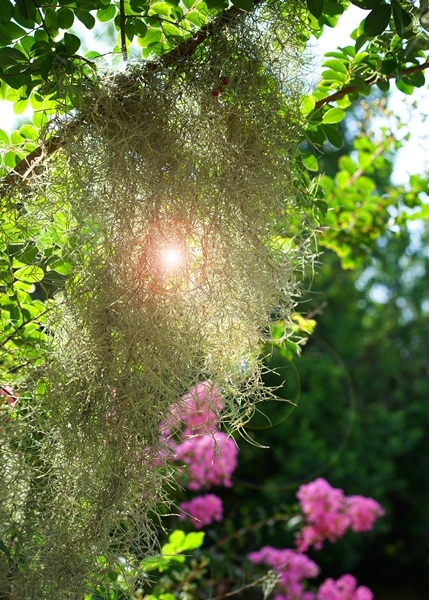 Spanish moss is very characteristic of the South, and try as I might, I had never succeeded in making an interesting photograph of the sage-green growth. On one magic morning, all the components came together: Lighting, composition, being able to get my lens within inches to a pretty clump of moss, and choosing the right camera settings. I am pleased to present this natural fluff in such a beautiful way. Illusion is me offering you a flat plane and you stepping into it. You have to come forth and I have to let go. Where does this picture take you? Are you by a river or a pond, in a completely still moment? Where the fluttering of a bird’s wings happens to move the needle on your awareness meter? The photograph hints at things but you fill it in, you give it a place, even a purpose, not just in your heart but in the world we live. Because the scene you imagine nearly-always exceeds what was going on at the time of picture taking. 6. Sacred Nine. A few days after the horrible church massacre of June 17th, I wanted to get a photograph that captured what was going on. I didn’t want to be obnoxious or intrusive. I wanted to make the picture impactful and unique. Cynthia Hurd, age 54. A library manager whose life was dedicated to books, children, and the church. Susie Jackson, age 87. A mother figure to generations in her family and a renowned cook of collard greens. Ethel Lance, age 70. A church custodian who found strength in a gospel song to overcome life’s challenges. DePayne Middleton Doctor, age 49. A minister whose angelic voice could heal troubled hearts. Clementa Pinckney, age 41. A pastor and state senator who lent his booming voice to the voiceless. Tywanza Sanders, age 26. A barber, poet, and aspiring entrepreneur ready to take the world by storm. Daniel L Simmons, Sr. age 74. A minister who served as a model of endurance and service to God. Sharonda Singleton, age 46. A pastor and coach who became her runners’ biggest cheerleader, on and off the track. Myra Thompson, age 59. A builder of faith who worked to restore her beloved church’s properties to their full glory. 7. Kids at play. When I sorted through my fountain photographs this one stood out. 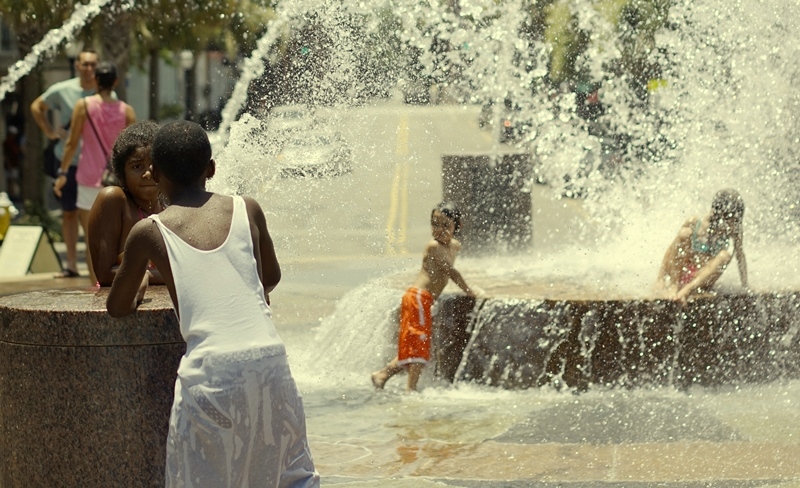 Not just for its clarity, or it showing children cooling off in 104-degree heat, doing what they wished. I picked this image for the girl’s expression. All the more so because she was giving her look to her companion, as they shared placing palms over the water spigot. She captured what I imagine many people were feeling that week. 8. Defense by day. 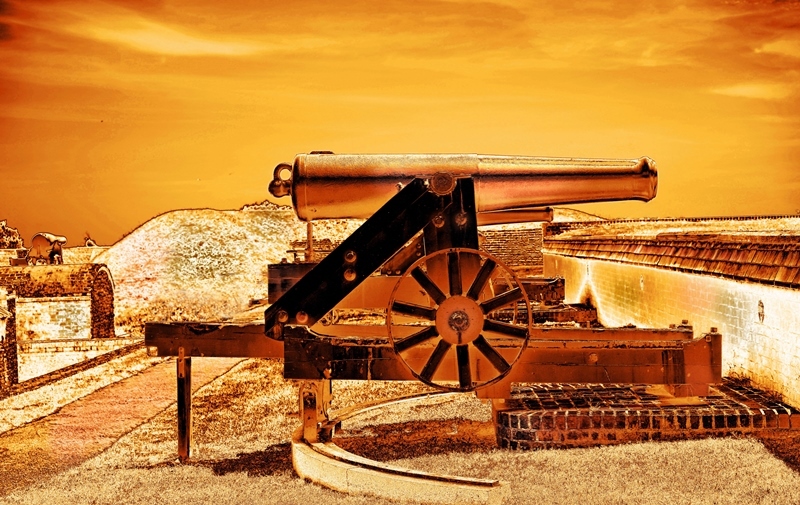 The cannons at Fort Moultrie make an impressive sight. The level of preservation is astounding, and worthy of study. Here we are inside the fort, which has been rebuilt at least four times throughout the centuries. The cannons are designed to pivot in a half-circle. One can imagine the sight with ammunition and a full crew. This image is a gold, bronze and copper plate photograph where I’ve selectively blended bronze and copper elements into the gold host image. This blending creates some depth and relieves the eye of the tedium of pure gold. 9. Defense by night. 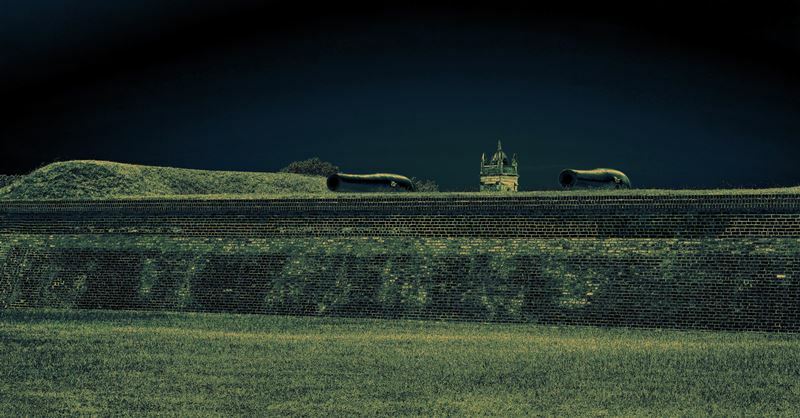 Outside the walls, we have a glimpse of what it would be like to approach the fort under cover of darkness. 10. The look. She waits, nowhere to go, among none of her kind, and in solitary confinement. 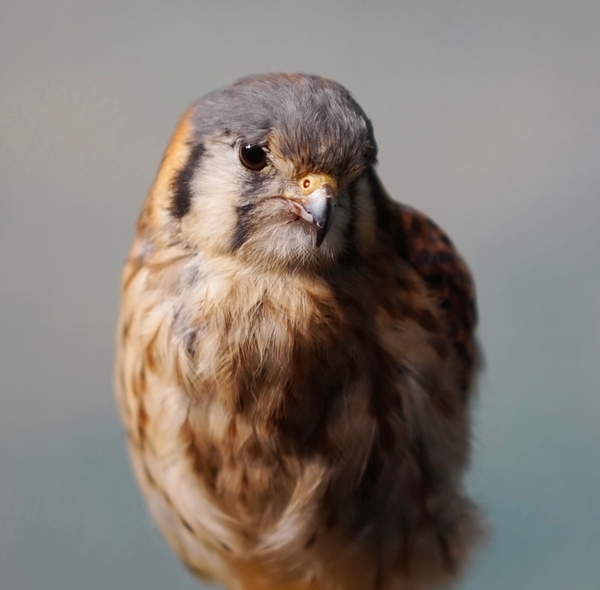 This pretty, tiny bird is a resident at the Charleston Aquarium and has been present for at least two years. I know little about her; I read her placard but didn’t record her information. The Aquarium’s website makes no mention of her. Most of the animals on such displays have been rescued from harmful situations. They are well taken care of. Her look haunts me. Through the glass–it was no real barrier, after all–it’s as though she’s saying, you’re but one of hundreds that shuffle by me every day. Do you have my answer? Sadly, I do not. What I have is a picture, and her look, which I will share with the world. Her lower tufts are like hands gently touching, as if she awaits my response. I had none to offer. 11. The look, part 2. 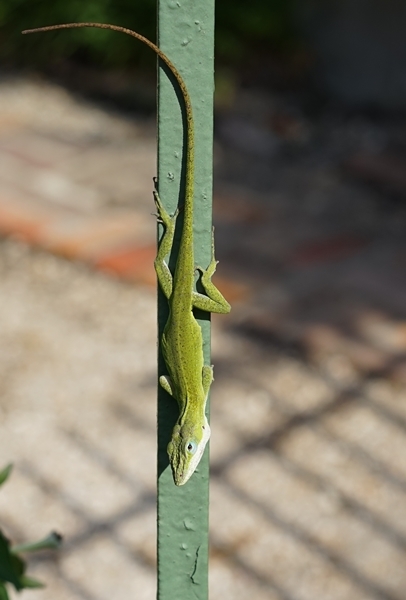 On a day when I was shooting Spanish moss, this little critter jumped out of the bushes to see what I was up to. Once again, an animal looked me in the eye. Is there anything behind the glance? 12. Cooling off. As we have seen, Charleston has a variety of animals. Some are in captivity; some in the wild; and some in servitude. 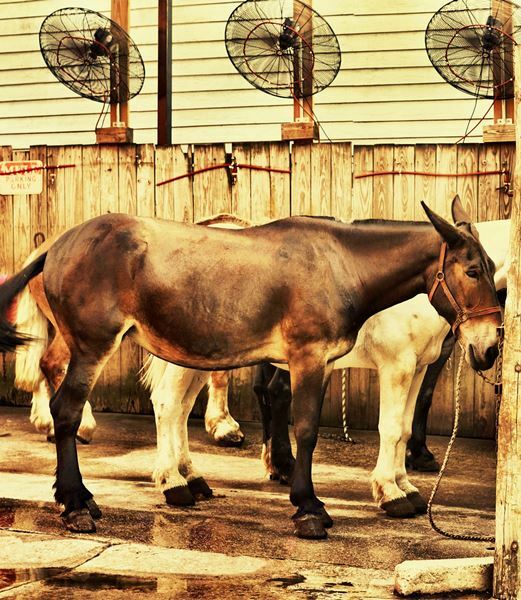 After a hard day, three mules cool off with water sprays and high-powered fans. The mules work pulling tourist wagons through town. They are well cared for. 13. Old timer. 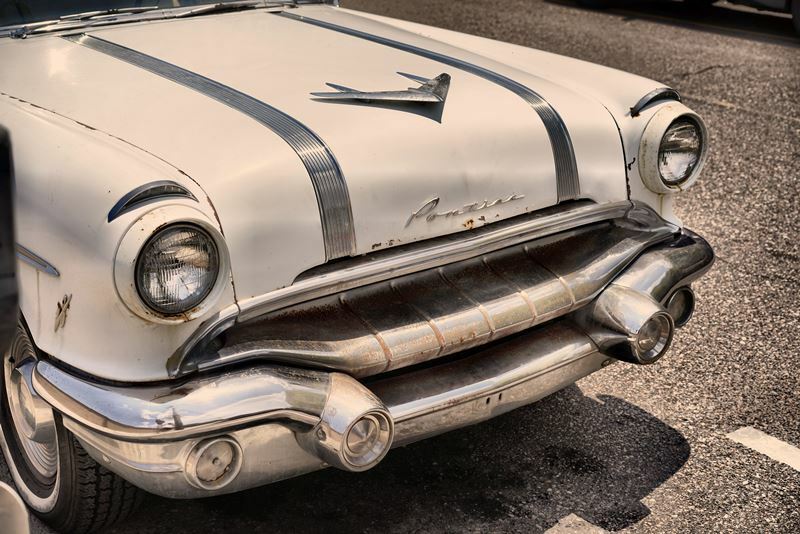 I saw this 1958 Pontiac roaming the city for three days before I could capture her. No Antique plates, no evidence of repairs or repainting, and the interior looked original too. What a pretty lady. 14. State’s pride. 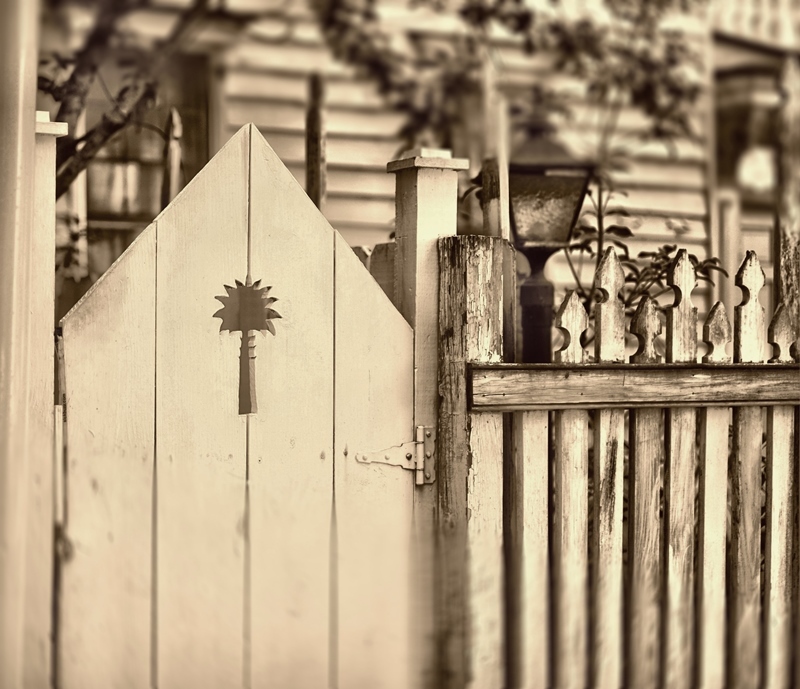 An old fence with a hand-cut palmetto tree honors South Carolina’s official symbol. Thank you for visiting Charleston, Reframed. Feel free to post a comment, below. For over thirty years, I have enjoyed drawing beautiful shapes and writing complementary stories. The imagery tends to focus on our place in the world—whomever or whatever we may be. I am influenced by Twentieth Century history—I read vintage magazines, books and letters. Inspiration comes from visualizing human achievement and personal interaction—derived from people, places and things which may be obscure, but never insignificant. My pen-and-ink THE MAGNIFICENT RECOVERY was selected by the Museum of Fine Arts, Boston for their 2008 summer art auction. 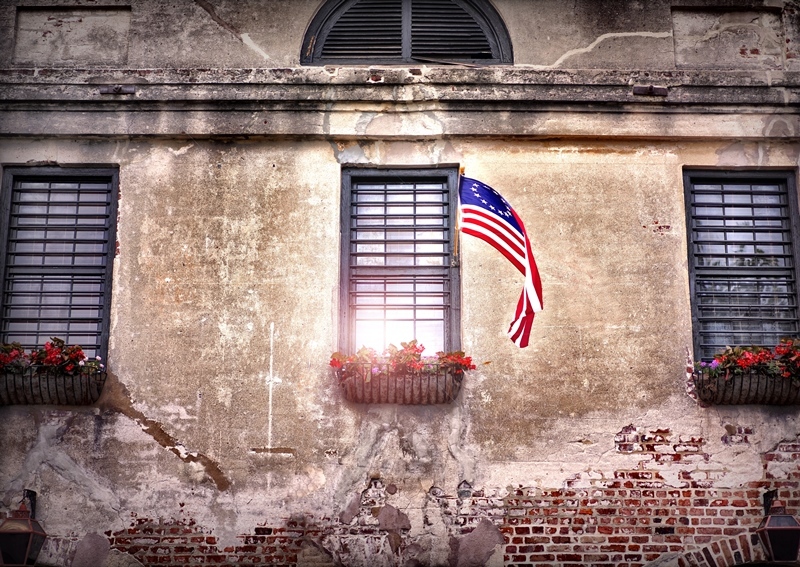 This entry was posted in Charleston, Photography and tagged Charleston, South Carolina. Bookmark the permalink. Enter your email address to follow Ara and receive notifications of new posts by email.